(Bloomberg Opinion) -- China’s technology-hardware sector was one of the biggest beneficiaries of a decade-long global boom. It may be among the hardest hit by the downturn. ZTE Corp. and BYD Co. late Wednesday reported full-year earnings that missed estimates. Earlier in the month AAC Technologies Holdings Inc. had a similar situation. Each has its own reason for woe. ZTE’s troubles are the most obvious. The maker of smartphones and networking equipment was caught defying an agreement with U.S. authorities, got cut off from critical components, and struggled to hit its stride again after that ban was eased. Its full-year loss of 6.98 billion yuan ($1.04 billion) was wider than even the most bearish of estimates, while revenue also missed. 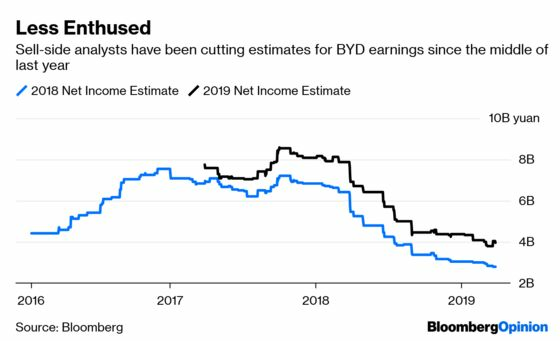 BYD, which makes both electric vehicles and mobile-phone components, managed to meet expectations for full-year net income, but only because analysts trimmed their forecasts more than 5 percent in the past four weeks. Net profit margin of 2.3 percent was the lowest in five years. And while automobiles have grown to become BYD’s biggest business, its handset division was a revenue laggard last year – climbing just 4 percent versus corporate growth of 19 percent. It’s likely to be a drag for 2019, too, if the company’s statement about the first quarter is anything to go by. Like BYD, AAC only managed to hit full-year earnings estimates because analysts cut their numbers after the maker of smartphone speakers and haptic vibrators turned in a disastrous June quarter. And in the last month they’ve turned even more bearish on 2019. “AAC Technologies' profit growth shows no sign of recovery,” Bloomberg Intelligence analysts Anthea Lai and Sin Yee Cindy Lam wrote this week. This story is repeated throughout China’s hardware supply chain, but you need to dig below the surface to see what’s going on. 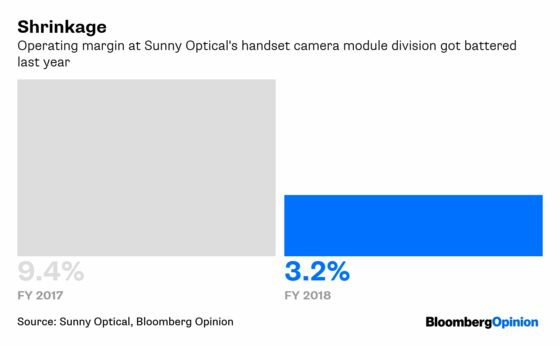 Sunny Optical Technology Group Co. met earnings and revenue estimates when it reported last week, yet sales at the division that makes handset camera modules climbed just 10 percent (versus 16 percent overall) while operating margin in that unit plunged by two-thirds. So far investors don’t seem perturbed. Of these few companies, only BYD’s results elicited any immediate backlash. AAC jumped after its release and it took two days for shares to slide back to their pre-announcement levels. After an initial drop last week, Sunny’s stock has moved sideways while ZTE was getting cheered on by the market Thursday morning. Equities traders seem to believe that some short-term, company-specific strength will be enough to stave off macroeconomic and industry headwinds. That’s a pretty big bet to make. As I wrote earlier this week, if a giant like Samsung Electronics Co. can’t avoid a severe and unexpected deterioration, then you can bet others will be suffering, too. Wednesday night’s statement out of Germany showed just how this scenario is likely to play out across the industry. In view of continued global economic uncertainties and weaker endmarket demand Infineon Technologies AG is adjusting its outlook for the 2019 fiscal year revenue and earnings downward. China bulls want to believe that the worst is over or that their favored tech stock has its own rosy story to tell. The question is whether they want to bet against bigger forces that even global giants can’t overcome.